i’m in seattle for work for a couple of days… my kiddo sounds like he’s doing great at home with dada. oh, hello my old breast pump friend, haven’t spent time with you in a long while… oh hello self, you haven’t spent this much time alone with me in a loooooong while! 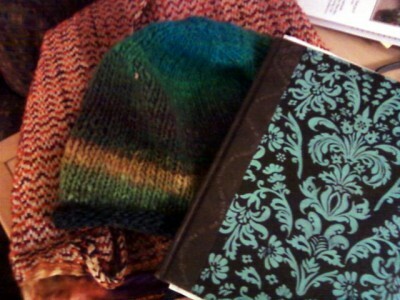 (got my laptop bag, wool hat and journal pictured above- lately i’m into fun colors!) got posts brewing, but mostly i left little bits and pieces of them home so they’re drafts. though i imagine even this country mouse can get inspired here in the big city (i’ve already got plans for after my long day buried up to my elbows in fish guts!) it’s our first time apart (quinn and i) for over 24 hours… but it feels good. i’m just glad it’s only 3 days! yay for getting some quality 'you' time!